I have been meaning to share this with you for a few days now. 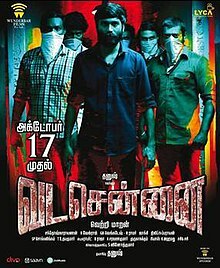 I managed to catch Vetri Maaran’s Vada Chennai by the skin of my teeth just before it left theatres. Thankfully, it was released here (in Delhi where I live) with English subtitles. I loved many things about Vada Chennai, but I was not blown away. This story of gangsters who called the shots in north Chennai from the late 1980s to the early part of this century revolves around Anbu (played by Dhanush) who evolves during the course of the narrative from an innocent, young, gifted carrom player to a Godfather-like criminal overlord. We become acquainted with the many people who had an impact on his life, most especially his girlfriend and later wife, Padma (Aishwarya Rajesh), a don named Rajan who was invested in the welfare of the local poor, Rajan’s tough-as-nails wife Chandra (Andrea Jeremiah), and rivals-in-crime Senthil and Guna, all this against the backdrop of historic political developments such as the deaths of MGR and Rajiv Gandhi, and the rise of Jayalalithaa. What worked for me: Dhanush’s restrained performance; his subtle yet clearly discernible physical transformation; the fact that although this is a male-dominated film (as most Tamil films are), and though Padma and Chandra are only supporting characters, they are still crucial to the proceedings and Chandra, at least, is not merely present as a facilitator/enabler in the men’s lives; the impression left by the two charismatic women artistes despite their limited screen time; and via Senthil and Guha, the spotlight Vada Chennai places on how fluid the definition of goodness can be – at different points in the story, one or the other of them appears to be the nice guy of the two, depending on the perspective from which they are being viewed. All this goes in Vada Chennai’s favour, but the many sub-plots, the multiplicity of characters and the back and forth in time get confusing after a while. And the overall plot has limited novelty value. Bitter gang wars, the stranglehold of the underworld on the slum dwellers in the film, politicians who manipulate the poor while awarding contracts to private enterprise under the pretext of public welfare, a don who has the common people’s interests at heart – there is nothing here that has not already been covered by Indian cinema in general or Kollywood in particular, nor is the treatment unusual enough or gripping enough to be compensation. So yes, this is a polished production. And yes, Dhanush’s performance and the film’s other positives did keep me engaged till the end. But Vada Chennai is not gut-wrenchingly beautiful and heartbreaking like Vetri Maaran’s last film Visaranai. Not even close.